Use a market order to guarantee a fill. A market order is the fastest and most reliable way to get in out of a trade, and is appropriate if getting filled is more important than getting a certain price. A market order is the most basic type of trade order. It’s an order to buy or sell at the best available current price. 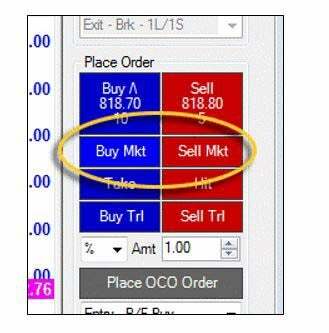 Most order entry interfaces – including trading apps – have handy "buy" and "sell" buttons to make these orders quick and easy. As long as there is adequate liquidity, this type of order is executed immediately. The primary advantage to using a market order is that you’re guaranteed to get the trade filled: If you absolutely need to get in or out of a trade, a market order is your best bet. The downside, however, is that market orders don’t guarantee price or allow for any precision in order entry, which can lead to costly slippage. You can limit losses from slippage by using market orders only on instruments that trade with good liquidity. A market order is the most basic type of trade order. Order entry interfaces usually have “buy” and “sell” buttons to make these orders quick and easy. Image created with TradeStation. Here’s an example. Say you place a market order to go long 1000 shares of stock ABC when the best offer price is currently $20.00 per share. If other orders in the queue are executed before your trade order, the market order may fill at a higher price. It’s also possible for parts of the order to execute at different prices. In this example, half of the order might execute at the best offer price and the other could fill at a higher price. A market order does not guarantee price – it only guarantees a fill.